While Percy & Jason were busy setting the new brown circuit, I took the chance to use the advantages of this fine job and head out into the Peak District to see if I couldn't make good use of this cold weather. Using some inside knowledge I got warmed up...inside. This really is the best way to get going on these cold days as trying to get fingers and body warm on grit at the minute is pretty hard work. 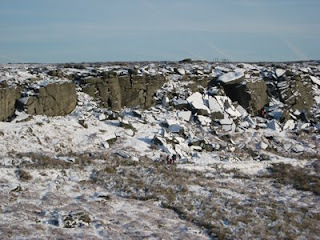 A good 45min climb, including testing some of the new browns, and Vicks and I headed out to Burbage North. 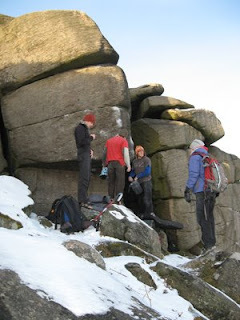 Once out, the friction was fantastic and the grit was in good nick....when it wasn't completely covered in snow. Unfortunately for us, the snow from the day before had stayed and a fresh flurry overnight pretty much ended our climbing goals for the day. A few things were dry, all in the 7c region, so we had a play, tried to stay warm and generally enjoyed the surrealness of a white day in the dark peak. 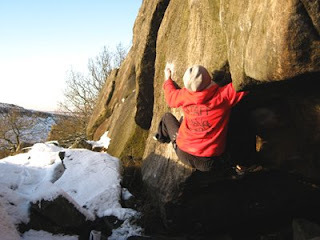 One of the very few problems dry, Westernise at Burbage West.